Developer: BANDAI NAMCO Studios Inc. Soft. Co.: BANDAI NAMCO Studios Inc. 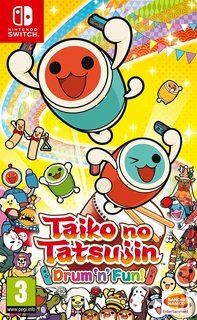 Looking at Taiko no Tatsujin: Drum n Fun! you can't help but feel that with the likes of Rock Band and Dance Dance Revolution we here in the west might only have only grazed the surface of the rhythm game genre. The Taiko series has already had a long life over in the arcades of Japan, entertaining generations of gamers with its drum-based action since the olden days of 2001. It's spawned multiple home versions, too, but due to licensing issues it's only now that we're getting the first proper taste of the series over here with Taiko no Tatsujin: Drum n Fun! The core mechanics are pretty straightforward - a series of notes pass across your screen and you (or you and a pal) have to hit them at just the right moment in time with the music. There's an option to play with a drum peripheral, available as part of the collector's edition, or to use the Joy-Con's motion controls or the good old-fashioned buttons. What really sets the game apart, however, is it's... errr... esoteric art style. Frankly it's bonkers, and the only way to do it justice is to point you to some of the screenshots. There's a similarly weird and wonderful track list, featuring 70 songs including the likes of Dragon Ball Z, Neon Genesis Evangelion, Super Mario Odyssey, and many more. To sweeten the pot a little further there are mini-games for up to four players, but we know we had you at 'Super Mario Odyssey'.